Tabla Rasa was formed in the fall of 1996 and had its debut performance opening up for vocalist Srimati Laksmi Shankar as part of the Ali Akbar College of Music Summer Concert Series. They have gone on to share the stage with other great North Indian musicians including Ustad Ashish Khan and Anindo Banerjee. They base their original and traditional compositions on their collective years of training under the guidance of tabla maestro, Pandit Swapan Chaudhuri. Members of the group also draw upon the inspiration of master South Indian percussionists T.H. Subash Chandran and K. Sekar from whom they have studied. Tabla Rasa's vision is to respectfully represent the vast percussion traditions of North and South India while honoring their own cultural roots in jazz, contemporary new music, rock, funk, and other creative, improvised musical forms. They also hope to reflect their influences from other world music styles including traditions from Africa, Cuba, Indonesia, and Brazil. They are available for collaborations with Ancient Future wherever a large percussion section sound is desirable. Dan Kennedy holds a master's degree from California Institute of the Arts and a doctoral degree from the State University of New York at Stonybrook. His primary teachers have included Raymond DesRoches, John Bergamo, and tabla maestro Swapan Chauduri. He has been a founding member of several contemporary music ensembles including Tabla Rasa, California E.A.R. Unit, the Talujon Percussion Quartet and has performed throughout the United States, Europe, and Japan. In addition to extensive solo work, Dan has also performed with the Lincoln Center Chamber Music Ensemble, the Group for Contemporary Music, the New York Music Ensemble, Earplay, Music Now, and the San Francisco Contemporary Music Players, and the New Jersey Percussion Ensemble. Dan has recorded with a variety of renowned artists such as Tod Machover, David Starobin, Fred Sherry, Paul Hiller, and others. Dan has traveled to India and studied South Indian drumming from T.H. Subash Chandran and K. Sekar. He has also studied Balinese gamelan and works often with gamelan Sekar Jaya. He has taught at Dominican College, University of Bridgeport, and is currently on the faculty at California State University, Sacramento, where he is the Instructor of Percussion and the artistic director of the festival of New American Music. Brad Van Cleve has been studying tabla from Pandit Swapan Chaudhuri since 1981. He has spent extensive time in India where he deepened his tabla studies in Calcutta and Shantininketan. He is an in-demand accompanist and an assistant teacher of tabla at the Ali Akbar College of Music. Jim Santi Owen is a multi-instrumentalist, teacher, performer, and mover who has been active in the Bay Area since 1991. He has been studying tabla since 1991 from Pandit Swapan Chaudhuri at the Ali Akbar College of Music and at the California Institute of the Arts. Owen has also lived in India and studied South Indian percussion including mridangam, ghatam, kanjira and morsing from T.H. Subash Chandran and tavil from K. Sekar. At Cal Arts, Owen studied Jazz with Charlie Haden, James Newton, and Tootie Heath and African drumming and dance from the Ladzekpo Brothers. A founding member of Tabla Rasa, Owen has worked with Pharaoh Sanders, Alonzo King's Lines Ballet, Mia Masaoka, Ancient Future, The Jumping Buddha Ensemble, Trancemission, TOCK, Mobius Operandi, Stephen Kent, Miguel Frasconi, Mark Growden and others. He is a resident Artist with LEAP and Multicultural Music Presentations and has taught ages five to sixty-five in schools, universities, and community centers. Owen is the co-founder of Percussion Theater, a simultaneous drum/dance/vocal/theater form which he performs and teaches with Jules Beckman. He was the music curator of the 1996 San Francisco Festival of Improvisation and a co-recipient of the 1997 Isadora Duncan Award for Best Original Music for a New Dance Piece for his work in creating the score for "Sacred Text." 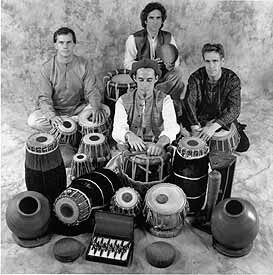 Tim Witter began his tabla training with Ustad Alla Rakha in 1980. He has studied since 1985 with Pandit Swapan Chauduri, the resident tabla teacher at the Ali Akbar College of Music. He has made numerous trips to India for study and performance, and in 1994/1995 completed a research/performance grant awarded to him by the American Institute of Indian Studies. Tim has taught at the Ali Akbar College of Music in Basel, Switzerland and has performed throughout Europe. Currently he is a staff teacher at the Ali Akbar College of Music in San Rafael, California as well as being an active and composer in the San Francisco Bay Area Indian classical and contemporary music scenes. In addition to studying tabla, Tim has lived in Madras, India and studied South Indian drumming from T.H. Subash Chandran. Tim was a co-recipient of the 1997 Isadora Duncan Award for Best Original Music for a New Dance Piece for his work in creating the score for "Sacred Text." To reach Tabla Rasa, contact: info@ancient-future.com. Himalayan Wind: Nepali flute master Manose is widely recognized as Nepal's premiere flautist. This program featuring him includes Nepali folk music, raga, and contemporary world music. An excellent choice for a collaborative concert with Tabla Rasa. Celtic Raga: Matthew Montfort (guitar) performs traditional Celtic melodies and raga with tabla accompaniment. An excellent choice for a collaborative concert with Tabla Rasa.